The College had the extreme good fortune to host a visit last week by Dr. Walter Bumphus, the president and CEO of the American Association of Community Colleges. Headquartered in Washington, D.C., AACC represents and advocates for more than 1,100 community college and their 13.3 million students. 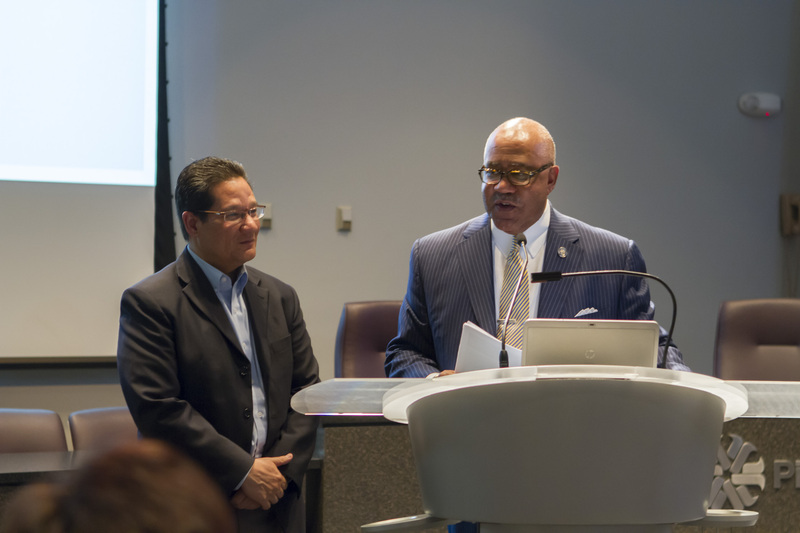 Dr. Bumphus’ presentation to PCC employees and members of the community was the perfect mix of information, inspiration and wit, and it’s easy to see why he is one of the most respected leaders in higher education. PCC and the nation’s community colleges “are doing some of the hardest work in America,” Dr. Bumphus maintains. The challenges we and our fellow community colleges face are substantial: aligning with K-12 systems and bachelor’s degree-granting colleges and universities to improve college readiness and implement pathways to student success and completion; engaging business and industry to create apprenticeship opportunities and a national credentialing system for career and technical education; and becoming more accountable to our diverse constituents by making data-inspired decisions that consistently deliver tangible value. Yet the heightened expectations and scrutiny make this a heyday for community colleges. When our institutions are referenced a half-dozen times in a State of the Union address, when community colleges annually vie for the $1 million Aspen Prize for innovation, when community college leaders play substantive roles in discussions of national educational policy and workforce development, it’s clear that we are front and center during a crucial moment for our nation’s educational and economic future. Regarding PCC’s current probation, Dr. Bumphus believes that the College will successfully regain the fullest confidence of the Higher Learning Commission and the public. But more than that, Dr. Bumphus said he had “no doubt that . . . PCC will return to the outstanding district it has been.” We at PCC know what needs to be done to fulfill Dr. Bumphus’ prediction, and I believe we have the courage to actually follow through with lifting our students to better lives. As Dr. Bumphus succinctly put the issue, “One’s ZIP Code should not determine a person’s lot in life.” That is our view, too. Your roots should ground you, but not keep you from setting the highest of goals. Pima Community College is more determined than ever to provide the programs and services so that our students can have the opportunity to achieve their American Dream. This entry was posted in Uncategorized and tagged AACC, accreditation, American Association of Community Colleges, Dr. Walter Bumphus, student success on March 11, 2014 by pimachancellor.